The Bermuda Triangle (a.k.a. 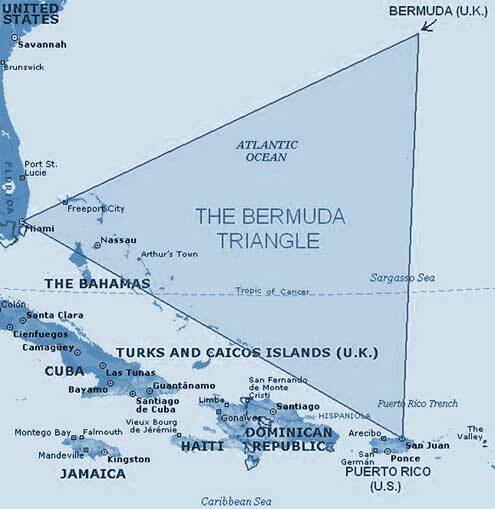 the Devil's Triangle) is a triangular area in the Atlantic Ocean bounded roughly at its points by Miami, Bermuda, and Puerto Rico. Legend has it that many people, ships and planes have mysteriously vanished in this area. How many have mysteriously disappeared depends on who is doing the locating and the counting. The size of the triangle varies from 500,000 square miles to three times that size, depending on the imagination of the author. (Some include the Azores, the Gulf of Mexico, and the West Indies in the "triangle.") Some trace the mystery back to the time of Columbus. Even so, estimates range from about 200 to no more than 1,000 incidents in the past 500 years. Howard Rosenberg claims that in 1973 the U.S. Coast Guard answered more than 8,000 distress calls in the area and that more than 50 ships and 20 planes have gone down in the Bermuda Triangle within the last century. Many theories have been given to explain the extraordinary mystery of these missing ships and planes. Evil extraterrestrials, residue crystals from Atlantis, evil humans with anti-gravity devices or other weird technologies, and vile vortices from the fourth dimension are favorites among fantasy writers. Strange magnetic fields and oceanic flatulence (methane gas from the bottom of the ocean) are favorites among the technically-minded. Weather (thunderstorms, hurricanes, tsunamis, earthquakes, high waves, currents, etc.) bad luck, pirates, explosive cargoes, incompetent navigators, and other natural and human causes are favorites among skeptical investigators. There are some skeptics who argue that the facts do not support the legend, that there is no mystery to be solved, and nothing that needs explaining.The number of wrecks in this area is not extraordinary, given its size, location and the amount of traffic it receives. Many of the ships and planes that have been identified as having disappeared mysteriously in the Bermuda Triangle were not in the Bermuda Triangle at all. Investigations to date have not produced scientific evidence of any unusual phenomena involved in the disappearances. Thus, any explanation, including so-called scientific ones in terms of methane gas being released from the ocean floor, magnetic disturbances, etc., are not needed. The real mystery is how the Bermuda Triangle became a mystery at all. The modern legend of the Bermuda Triangle began soon after five Navy planes [Flight 19] vanished on a training mission during a severe storm in 1945. The most logical theory as to why they vanished is that lead pilot Lt. Charles Taylor’s compass failed. The trainees' planes were not equipped with working navigational instruments. The group was disoriented and simply, though tragically, ran out of fuel. No mysterious forces were likely to have been involved other than the mysterious force of gravity on planes with no fuel. It is true that one of the rescue planes blew up shortly after take-off, but this was likely due to a faulty gas tank rather than to any mysterious forces. In short, the mystery of the Bermuda Triangle became a mystery by a kind of communal reinforcement among uncritical authors and a willing mass media to uncritically pass on the speculation that something mysterious is going on in the Atlantic.